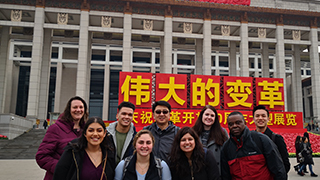 This year, I spent my spring break with the School of Diplomacy and International Relations on a sojourn to China as a capstone to the course, China’s Rise: Opportunities and Challenges, led by Professor Zheng Wang. For each one of us, it was our first venture into the mighty and misunderstood China and the cities of Beijing, Nanjing and Shanghai. In this enormously eye-opening and scintillating experience, we embraced academic learning, political and economic diplomacy and deep analysis of the historical developments in U.S.-Sino relations with a cadre of academics, professionals and fellow students. This power-packed trip, designed to immerse us into China’s history, culture and present day, challenged us to make the most of every moment awake as we made our way through visits to multiple universities, a think-tank, Apple’s Shanghai headquarters, a leading strategic consultancy, and China’s largest state-owned shipping and logistics services supplier, COSCO. The universities that we visited included Peking University, Nanjing University and the Shanghai International Studies University. In each of these academic institutions, we had the privilege of interacting with and learning from the professors and engaging with fellow students. Each of the faculty speakers in these esteemed universities provided us with their take on U.S.-China relations as well as the larger present-day international relations scene, and graciously answered students’ questions and queries. The interactive sessions with fellow students were also extremely enriching cultural bonding experiences. Most sessions provided an open and judgement-free zone for students from both nations to raise questions or concerns, ultimately fostering vibrant discussions and a rare direct exchange of ideas on misconceptions, nationalism, politics, human rights and future partnership. The professors’ encouraging attitudes and the Chinese students’ enthusiastic approach made our delegation feel welcome as well as comfortable within this foreign territory. At the Chinese Academy of Social Sciences’ Institute of Social Studies think tank, discussions revolved around the current challenges in U.S.-China relations, their impact on China’s academic environment and innovative ways to overcome obstacles. These conversations, coupled with the ones we shared at the Chinese universities, helped me and my peers to truly see that beyond our geographic and cultural differences, we are more similar to our Chinese counterparts than we ever realized, a humbling as well as heartening feeling. To learn more about the business environment, we visited GreenPoint, a market leader in strategic consulting within the U.S.-China commercial space. As a company providing in-depth cultural and economic insights to multi-national clients, they were able to share facts relating to the changing U.S.-China landscape, its repercussions, and the various dimensions of ongoing trade wars. They also offered some tips and tricks for not just working within this space but succeeding. 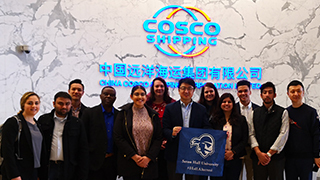 At COSCO we were provided with a private and exclusive tour, traditionally reserved for dignitaries, where we learned about the company’s trade routes, and its sheer magnitude and significance to the economic relations between our two countries and beyond. The visit also included a simulation ride aboard one of COSCO’s vessels, an experience that the delegation thoroughly enjoyed. Our last professional stop, Apple Shanghai, was one of the most profound and educational ones. Here we learned about Apple’s role in the Chinese economy, the power held by China in Apple’s supply-chain management and subsequent existence, China’s rise – from ancient through current times and beyond, and data privacy. Our schedule was not all work and no play; we also got to explore many tourist spots within the three cities, both in a guided manner and on our own. We had the privilege of visiting Tiananmen Square while the second session of the 13th National People’s Congress was in progress. The National Museum, Forbidden City, Jingshan Park, the Great Wall, Ming Tombs Changling, Spirit Way, Temple of Heaven and the 786 Art District were some of the popular locations we visited in Beijing. In Nanjing, we saw the Mausoleum of Dr. Sun Yat-sen and the Nanjing Massacre Memorial Hall. 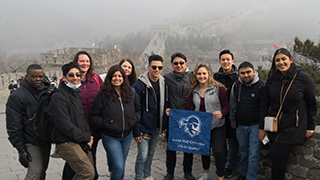 And in Shanghai, we went atop the Shanghai Tower, the world’s second tallest building, cruised on the Huangpu River and toured the Zhujiajia Traditional Water Town. Our delegation used express trains to travel within China and witnessed first-hand the nation’s progressive and impressive infrastructure and transportation system. Throughout our packed schedule, where each day seemed to bring forth experiences that were better than the last, we felt immersed in and humbled by the nation’s rich culture, warmth and respect that we received from each individual we encountered. By the end of our seminar, returning to the U.S. seemed like a proposition suggested too soon. Given the choice, not one of us would have passed up the chance to stay and soak in more of the culture, history and everyday life of China. This study tour provided us with a treasure trove of experiences and information that we will value for life, and cultural understanding and appreciation that we hope to build upon in the days ahead. French-language business initiative designed to help international visitors to La.